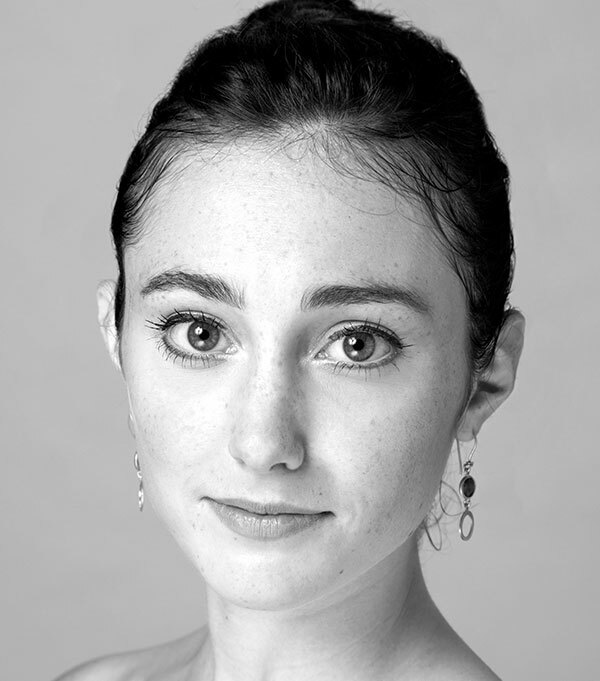 Ellen Rose Hummel created roles in Caniparoli’s Tears (principal), Marston’s Snowblind, Millepied’s The Chairman Dances—Quartet for Two, Scarlett’s Hummingbird, Tomasson’s Caprice, and Welch’s Bespoke. She has danced principal or featured roles in Tomasson’s Giselle (Giselle’s Friends), Nutcracker (Spanish), Romeo & Juliet (Harlots), The Sleeping Beauty (Fairy of Courage), and Swan Lake (Cygnets and Neapolitan); Tomasson/Possokhov’s Don Quixote (Gypsy Queen); Balanchine’s Coppélia (Coppélia Doll, Swanilda’s Friends, Brides, and Jesterettes) and Theme and Variations (soloist); Caniparoli’s Ibsen’s House (Rebecca West in “Rosmersholm”) and Lambarena; Cranko’s Onegin (Nurse and Friends); Robbins’ Fancy Free (Red Bag Girl); and Wheeldon’s Cinderella (Stepsister Clementine). Her repertory includes Balanchine’s Brahms-Schoenberg Quartet (3rd movement), Diamonds, Divertimento No. 15, The Four Temperaments, Prodigal Son (Sisters), Rubies, Serenade, Scotch Symphony, Stravinsky Violin Concerto, Symphony in C (4th movement and finale), and Symphony in Three Movements; Bubeníček’s Fragile Vessels; Forsythe’s Pas/Parts 2016; Makarova’s (after Petipa) “The Kingdom of the Shades” from La Bayadère, Act II; Morris’ Maelstrom; Nureyev’s Raymonda—Act III; Possokhov’s Firebird, Magrittomania, The Rite of Spring, and Swimmer; Ratmansky’s Shostakovich Trilogy (Chamber Symphony); Robbins’ The Cage and Glass Pieces; Scarlett’s Fearful Symmetries and Frankenstein; Thatcher’s Ghost in the Machine and Manifesto; Tomasson’s 7 for Eight, Criss-Cross, The Fifth Season, and Prism; and Wheeldon’s Number Nine and Rush. In 2015, Ellen Rose performed at Gala de Estrellas de la Danza in Menorca, Spain.